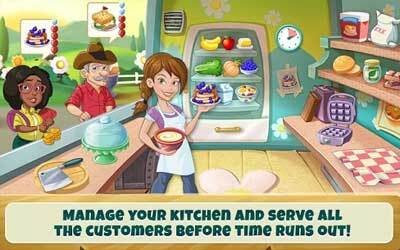 Kitchen Scramble APK 3.1.2 is cooking game that allows you to cook various kinds of food in kitchen. You are allowed to serve clients with the best recipes using many different types of ingredients. This game also allows you to learn the process of making new foods from other countries. You can go on trip to many different countries and learn the new dishes there. Kitchen Scramble is available with many levels and elements that will be able to make you enjoy this game even more. The challenges provided have to be mastered to earn more points. By earning points, you can go to the next level in the cooking game. This game is so popular among gamers around the world. You can play it by downloading the game in your Android mobile phone. The clients may come from different corners of the world. You should make them happy by serving various dishes that has been cooked properly. Kitchen Scramble game allows you to meet another characters that may be more interesting. You can also move the cafe to another different country. The meals you will cook are based on the real recipes. This game makes you able to get used to culinary world through an Android cooking game. Kitchen Scramble game provides fifteen different places and three hundred levels. There are also more than one hundred of real recipes which are available in the game. By playing it, you can develop your cafe in game by using bonuses, unlocking the premium, and upgrading the cafe you have. Kitchen Scramble game has attractive graphic design with Disney touching. To control this game, you just need to tap the item or clients to interact with them. The game which is simple to play is so entertaining. Kitchen Scramble for Android is one of the best cooking games for Android. Savor hours of content with more than 1000 levels in over 40 unique locations, and look for new levels added regularly! Whip up over a 1000 dishes with over 150 ingredients! Add a dash of flavor to the local cuisine to delight the demanding and unique customers! Use Premium Ingredients to earn bigger tips! Connect with Game Center or Facebook to find friends and compare high scores! Kitchen Scramble Facebook Players – Sign in with Facebook to share your progress with friends and get separate Supplies on web and mobile!